The Body Shop has always been passionate Against Animal Testing. They've never tested their products or ingredients on animals. All of The Body Shop products are certified under the Humane Cosmetics Standard, which is regarded as the highest standard for animal welfare in the cosmetics industry. In Canada, animal testing for cosmetic products and ingredients is still allowed. But there are safe alternative ways of testing cosmetics without using animals and as of March 11 2013, the European Union has banned all animal testing for cosmetic purposes. We are asking you, our loyal supporters, to add your voice to the call for our government to ban animal testing for cosmetics in Canada. 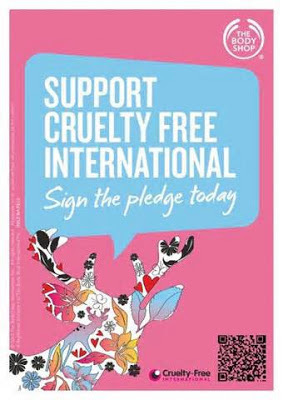 To sign the pledge to stop Animal Testing in Canada visit any The Body Shop boutique or please sign online here. In the last month, they’ve collected over 35,000 signatures across Canada. Every signature counts and they would love to add yours to the list.